Many types of hardness testers available that can rapidly and accurately determine the hardness value of a wide variety of materials including metals, plastics, large parts, small precision parts. Whether you need are portable testers, bench mounted testers, large scale floor mounted testers or dedicated testers that are integrated into your production lines, we can help you with your application. All hardness testers feature the latest designs, hardware and firmware that mean all testers are fast, accurate and demonstrate some the best gauge repeatbility and reproducability data in the industry along with excellent accuracies and resolutions. These rugged electromechanical testing machines are designed to test metals, composites, rigid reinforced plastics, webbing etc. in tension, compression, flexure, shear, tear and peel. These machines feature high precision interchangeable loadcells, superior pre-loaded ballscrews and powerful drive systems that mean they can easily tackle the most challenging of applications. 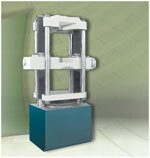 Load frame capacities are 100kN (22,500 lbf), 150kN (33,750 lbf), 200kN (45,000 lbf) and 300kN (67,500 lbf). All testing hardware is fully complemented by Tinius Olsen developed software that turns your hardware into a sophisticated quality analysis system. Be sure to examine our software products section to determine which package is right for your application. For maximum tensile testing throughput and capability, we offers a range of horizontal tensile testing machines in capacities of 5 kN (1,000 lbf), 25kN (5,000 lbf), 150 kN (30,000 lbf) and 300kN (60,000 lbf). 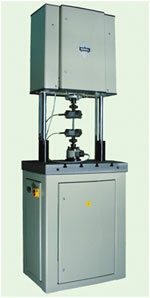 Our horizontal testing machines offer unique benefits over vertically oriented testers by allowing a range of accessories to be mounted next to the machine that can turn the machine into a fully automatic testing station. These horizontal machines are designed primarily for production departments and are typically in constant use, however, the grips can be modified to accommodate different shaped samples and alternate grips can be provided for customers to interchange as and when their test requirements change. Super "L" Testing Machines are rugged tension and compression hydraulic machines proven in thousands of demanding applications worldwide. Available with digital readout ...and optional servo and computer control systems. Maximum frame capacities from 150kN (30,000lbf, 15,000kg). All testing hardware is fully complemented by Tinius Olsen developed software that turns your hardware into a sophisticated quality analysis system. Be sure to examine the software products to determine which package is right for your application. 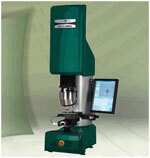 The instrumented strikersystem is the most accurate dynamic forcemeasurement system in the world. The mostimportant advantage of instrumenting thestriker with strain gages is that the appliedforce and the energy during impact can bemeasured. In the case of a drop towermachine, this is the only means for energydetermination, but for a pendulum machine,the energy is determined by an opticalencoder and also independently by theinstrumented striker. In addition to energymeasurement, additional data such as thecharacteristic loads, deflections, andenergies can be obtained Accurate measurement of the force duringimpact isan especially challenging task dueto the dynamic nature of the load and theshort time period over which the impactoccurs (typically 1 to 5 milliseconds). Thisis compounded by the requirement of atleast 10,000data points to accuratelyrepresent the applied force. This data sizerequirement and short test duration meansthat the storage of the force-time data mustbeprecisely triggered and this isaccomplished bycontinuously monitoring theload signal and saving data when asignificant rise in load occurs. Rapid loadchange events, such as acceleration of thespecimen up to the striker speed, and brittlecrack propagation. 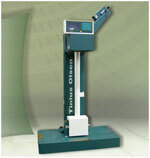 This machine type is available in two load ranges, for more detailed information, please refer to or brochure. 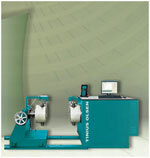 For maximum torsion testing versatility and capability, we offers a full range of torsion testing machines in capacities from 1,000 to 30,000 Nm. 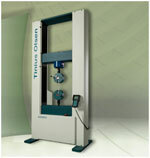 These uniquely superior torsion testers provide loading and weighing capabilities in both directions of rotation. This feature makes it possible to conveniently determine not only the ultimate torque load of a specimen, but how that specimen behaves under conditions of continuous or intermittent torque loading in both directions. 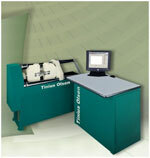 Essentially, each torsion tester comprises a variable speed drive loading system and a digital control and indicating system in a fixed unit. The weighing head with its strain gage torque sensor is mounted on a moveable unit which can positioned on the rails to accomodate specimens of varying lengths. All testing hardware is fully complemented by Tinius Olsen developed software that turns your hardware into a sophisticated quality analysis system. Be sure to examine the software products to determine which package is right for your application. ©2013 PACT. All Rights Reserved.